As a physical therapist, I enjoy hearing the different terminology for the rotator cuff (RC): “I think I tore my rotor cup” is one of my favorites. However, the thought of a torn rotator cuff is never amusing and with good reason conjures up fear and worry. 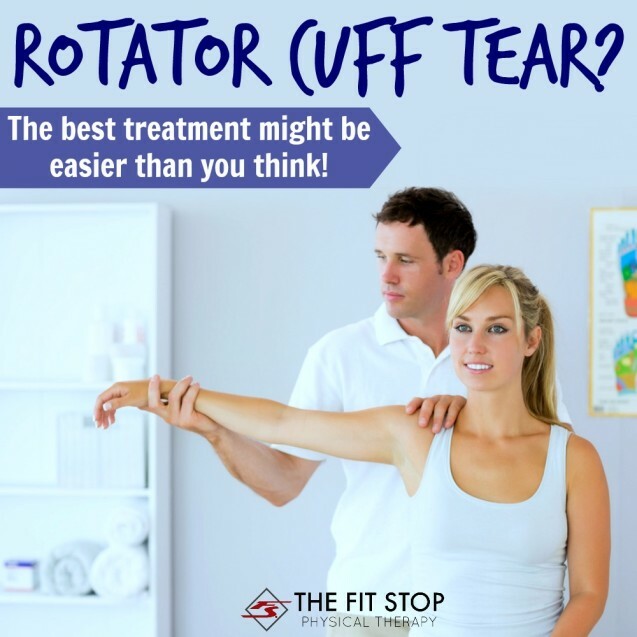 In today’s post here on the Fit Stop Blog, our shoulder specialist – Toby Bluth, PT, DPT – is discussing the rotator cuff. What is it? Why is it so important? And finally, what should be done if you suspect or have been told that you have a torn rotator cuff? 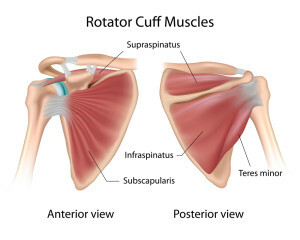 The rotator cuff consists of 4 different muscles and their tendons. Theses muscles lie deep in the shoulder underneath the superficial deltoid muscle. The tendons of these four muscles surround and attach into the head of the upper arm bone (humerus). The attachment of these four tendons envelop the arm bone in a “cuff” like fashion. The rotator cuff plays a very important role in the movement and overall stability of the shoulder joint. As the name implies, the RC helps rotate the arm. Reaching behind the back to tuck in a shirt, wash the back, or the all-important hair styling in the morning requires significant rotation movements of the arm in which the RC gets involved. When it comes to reaching up or away from our body, the RC plays a very important stabilizing role. When we reach forward, or out the the side, the RC contracts which keeps the head of the humerus centered into the shoulder blade, allowing the bigger shoulder muscles to do the main moving of the arm. Without that stabilizing effect, as hard as one may try, the arm simply cannot be moved. Also, the supraspinatus (top part of the RC) plays a very important role, along with the deltoid, in the lifting of the arm out to the side away from our body (abduction). A paralyzed or completely ruptured supraspinatus will make abduction impossible. So what if I have a torn rotator cuff? Hearing that a muscle may be torn never sounds good and can certainly cause lots of problems; that certainly applies to the RC. However, not all RC tears are created equal, and it’s important to understand the differences. Orthopaedic surgeons will generally refer to either a partial thickness RC tear, or a full thickness RC tear. As the names imply, a partial thickness tear does not span the entire tendon, however a full thickness tear spans the entire tendon, from top to bottom. When discussing tears, it is also important to understand exactly how they can develop. First, they can come on traumatically, meaning they develop from a specific incident such as a hard fall or work episode. Second, they can develop over time just from the wear and tear of life, referred to as non traumatic or degenerative tears. It is important to understand the difference between how these tears develop, because it may relate to how one should go about addressing the pain related to such tears. I recently read an interesting study about RC tears that came out the beginning of last year in the Bone and Joint Journal. This study shows that for non traumatic tears of the RC, physical therapy may be just as helpful as surgery. The study divided 167 shoulders into 3 groups: PT only, PT and Acromioplasty (surgery to remove part of the shoulder blade to allow for increased space for the rotator cuff), and PT, Acromioplasty and RC repair. Researchers followed the individuals for up to 1 year, and there were no significant differences in ratings of improvement between the 3 groups. According to the authors, “conservative treatment should be considered as the primary treatment for this condition.” I interpret that statement to say that PT should be the first thing to try with non traumatic RC tears, as that was the conservative treatment used in the study. How does PT help my torn rotator cuff? In June, I discussed generally how PT helps treat different conditions in a post titled, How Can Physical Therapy Help My Condition. In that post I used shoulder pain as an example and also referred to the study mentioned in this post. For most of my patients, however, it is difficult to understand what PT can do to actually change a torn rotator cuff. I believe that in reality, PT can do very little for the tear itself. Localized modalities can provide some initial pain relief. But to understand the main benefit of PT for tears, it is again important to think about the type of tear that is most likely present. If someone is more likely to have a non traumatic tear that has developed over time, there is much that PT can do for that person to reduce pain without affecting the actual tear. With an in depth evaluation, your PT at the Fit Stop can assess individual weaknesses in range of motion and strength that have contributed over time to causing the tear. Then, with focused guidance to ensure proper form, exercises will be given to help strengthen weak shoulder muscles and improve specific movement deficits. When performed with consistency, these exercises will help the shoulder feel better gradually, and surgery can be avoided. So if you’ve had shoulder pain for some time and you suspect a rotator cuff issue, (or you’ve even been told you have a tear), keep physical therapy first in your mind! There is a really good chance that will be all you will need to get that pain under control and help prevent even more problems in the future. Come find us at one of our 4 convenient clinic locations and we can get you back to the things you love doing most!